Meet Lynn Feinstein, Portland Interior Decorator of Mobius home. Lynn specializes in designing with eco-friendly building products and furnishings. Her work shows how interior spaces can exude style while still having the environment’s best interest in mind. 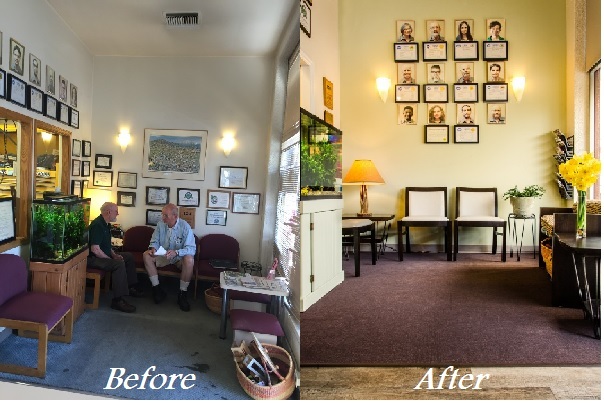 Lynn gave new life to this well-loved waiting room of a Hawthorne Auto Clinic. As you can see from the before photo, the carpet, vinyl, and furnishings were stained and worn. 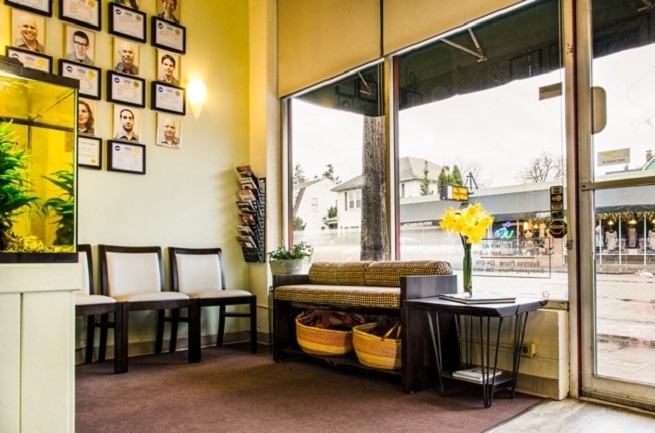 This 20-year-old waiting room was in need of a makeover. The flooring used in this project is Moduleo Vision Collection Luxury Vinyl Plank Flooring in Old English Oak. The carpet tile is Flotec Metro Collection in Chocolate. Installation was completed by Portland area contractor Mike Walters.